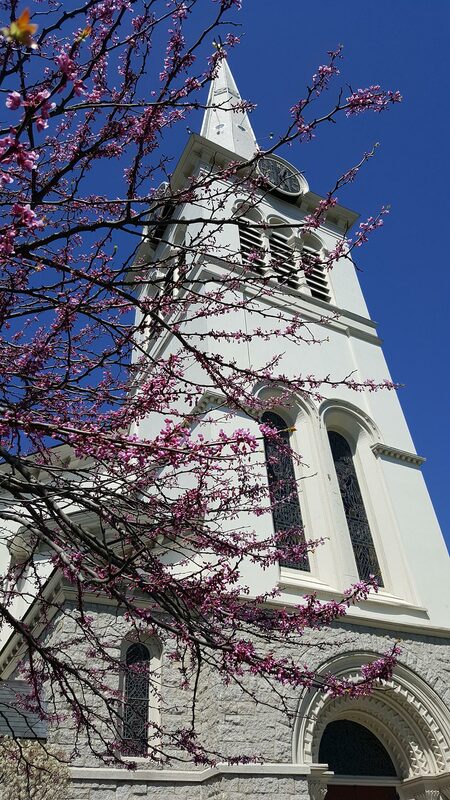 We welcome with joy these new members into our family at First Congregational Winchester! Please introduce yourselves and give them a warm welcome when you see them. Their membership will be celebrated with a cake at our picnic following worship today. While I’m new to the church, I am not new to Winchester. I grew up here and then moved to Tucson AZ for 15 years. Now my daughters, Julia (6) and Rose(3), and I are back in Winchester. I’m a math teacher at WHS and I spend all my time playing with my children or grading papers! I look forward to being part of the church. Lifelong Episcopalians Bill and Nancy Goodwin never considered shopping around for a church when we moved to Winchester 49 years ago. Nancy taught Sunday School for many years at Epiphany then drifted away in later years, while Bill kept up the family involvement with occasional early morning service attendance. We began attending FCC when our daughter chose this church for her children, and, quite unexpectedly, we find that we love it here. We keep busy maintaining an old house and overgrown garden as well as we can while having fun with the family. Otherwise our biggest shared interest is in Industrial Archeology. I live in Woburn and work in Burlington. I was raised Catholic in Marshfield MA. I am a long time member of Dignity, a progressive inclusive community of LGBTQ Catholics and friends. I have been a liturgy committee member, a volunteer for Harbor to the Bay fundraising bike ride, and have started volunteering with FCC Winchester by working at the Bean Soup Supper and the Dwelling place. I have felt welcome at FCC Winchester and look forward to being a member in prayer and service. Josh and Jen Murtie live in Winchester with their two sons, six year old Dylan and three year old Ethan. Josh is from Vermont and Jen is from Kenya and they’ve lived in the Boston area for the last 14 years. Prior to that they lived in the Washington DC area and attended National Presbyterian Church. They love to golf and to travel with their boys. What I decided to call “My Medical Adventure with Brain Cancer” has truly had a major impact on my life and also that of my very dear husband, Jim Stansfield. He’s been with me through every dip and dive of this rollercoaster ride. The biopsy result was terrifying: Glioblastoma multiforme, or GBM. (It is widely considered to be the most deadly of the incurable brain cancers, with a median survival rate of only 15 months). That was in the fall of 2005 and my oncologist advised that I should get my affairs in order and that if there was something I’d always wanted to do, I should make plans and do it. After the diagnosis, lots of chemotherapy and radiation began. I continued in my communications work at MIT where I’d been employed for 32 years. I decided to retire very early (at age 55) when my oncologist suggested that I do two more years of monthly chemotherapy cycles (as extra insurance against tumor recurrence). I realized that continuing my work at MIT (even at a much-reduced schedule) would be quite difficult, and I didn’t want to let colleagues down when I might feel too ill to complete my assignments. At that point, I was the Senior Communications Officer in the Office of the President. Jim & I agreed that it made more sense to focus on my health and enjoying whatever time I had left to live rather than working longer to increase my savings and retirement income. Jim & I enjoy many types of music, gardening, bird watching, and swimming together (We actually met each other in the MIT Pool). Although I’m currently tumor-free, I think I’ll request to be on the FCC of Winchester’s prayer list. Originally from Yorkshire, England, I moved to the US in 1975, and have lived in Winchester since 1983. Janet and I were married in 1980. We met at the MIT pool, and still enjoy swimming together. I was baptized into the Church of England, though until I was 10 I went to the Quaker Sunday School where my grandparents were members. Later, I joined the choir in the Church of England in the village where we moved. I haven’t been a member of any church since I came to the U.S. I have a math and science background, but since I retired, I realized I seem to be very happy gardening, playing the piano, or in my workshop.